I may have posted this picture before. 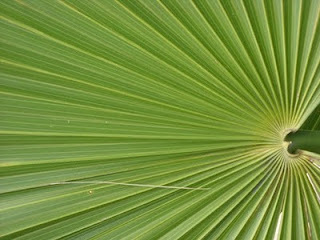 It is a close up of a palm frond that is on a plant on Wilton Drive. These are a fairly common palm, I believe it could be a Saw Palmetto, you see them all over the place. This particular one graces the front of the Gables on Wilton Drive and was in perfect condition when I walked past that day. It is still there as of this writing, but the frond is no longer this pristine, although the plant is faring well. The Gables came in and flattened down a beat up nursery and a scruffy little strip center and built a rather large apartment community on the drive. Viewed from the wrong angle, it looks somewhat utilitarian, although the people have softened that up a bit by putting palm trees on the balconies and some rather nice plantings in some small boxes in front of the building. This has been one of the major changes I've seen since I moved here. The old Florida buildings are being knocked down and large buildings put up in place. That isn't exactly a problem since the ones being torn down aren't being maintained properly, so it ends up being a plus for the city. In the case of the Gables, it is a very large plus. That and the folks that work there seem to be quite pleasant additions to the community as well.